Geologists claim to have discovered a new continent to the east of Australia: Zealandia. At 4.9 million square kilometres of land mass, 94 per cent of which is under water, Zealandia would be the world's smallest continent. The 11 scientists behind the claim presented their findings in the study "Zealandia: Earth's Hidden Continent" in Geological Society of America, making a case for Zealandia to be recognised as the world's eighth continent in its own right. According to their study, the land mass comprises all the four attributes needed to be considered a continent, including the presence of different rock types and crucially "the high elevation relative to regions floored by oceanic crust." "It was not a sudden discovery but a gradual realization," the scientists wrote. 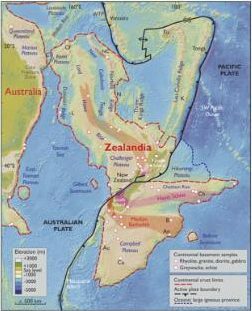 The term Zealandia was coined by geophysicist Bruce Luyendyk in 1995, at which time it was believed to possess three of the four necessary qualities required for continent status. A recent discovery using satellite technology and gravity maps of the sea floor have revealed that Zealandia is a large unified area, fulfilling all four requirements. The political and economic implications of a new continent would be manifold, with the question of clearly defining what belongs to New Zealand and Australia particularly salient in light of offshore mining in the area. A six-year study by the GNS Science research institute in New Zealand has revealed that there could be tens of billions of dollars worth of fossil fuels located off-shore in the region. According to the study, the 94 per cent of Zealandia currently submerged broke away from Australia and sank 60-85 million years ago.